This week is really busy already! Hence, being behind in my posting! The Palmer house is bustling with preparations for the first annual Carpenter’s Banquet this Friday. We are cooking for about 250 people, and my friends, that is a LOT of food. I am amazed by how much it really is. Forty heads of lettuce for the salads, forty butternut squash, fifty eggs for the bread pudding, two gallons of salted caramel for the bread pudding. Two gallons?! Of caramel? It just adds up. Anything multiplied by 250 is going to be insane and I will be the first to say that I’m super glad I’m not a caterer! I think it’s going to be an amazing event and all the proceeds from ticket sales and the silent auction will go directly to Carpenter’s Church for their supportive housing project. It’s nice to be a part of something so good. Tonight I give you a simple dish that is packed with flavor. It’s a riff off of yet another Tyler Florence recipe from his wonderful family cookbook, Start Fresh. The recipe originally called for peas, but I had lima beans and I think it worked great! I loved this dish because it was really simple to make and had a protein, a starch and a vegetable in just two dishes! And it felt super comforting without being too heavy. We’ve got a few chilly nights left in this season, I’m afraid, but with dishes like this, it won’t be so bad to stay in and cook! Preheat the over to 400F. Season the salmon portions with salt and pepper. In a large ovenproof skillet, heat the oil over medium-high heat. Add the salmon pieces and cook without turning until browned on the bottom, 2 to 3 minutes. Transfer the pan to the oven and cook until the salmon just flakes when tested with a fork, about ten minutes. In a large saucepan, bring the broth to a boil over medium heat. Add the lima beans, reduce heat, and cook until bright green, about 2 minutes. Scoop out the beans into a bowl. Transfer half of the beans to a blender and puree until smooth. Set aside. Keep the broth warm on the stove. In a large saucepan, toast the rice over medium heat, stirring often, until the rice has a nutty aroma, 3 to 5 minutes. Add the broth, one cup at a time, stirring and waiting until each addition is almost absorbed before adding more. Continue until most of the liquid has been absorbed. Before all the liquid has been absorbed, stir in both the pureed and whole beans, butter, and cheese. 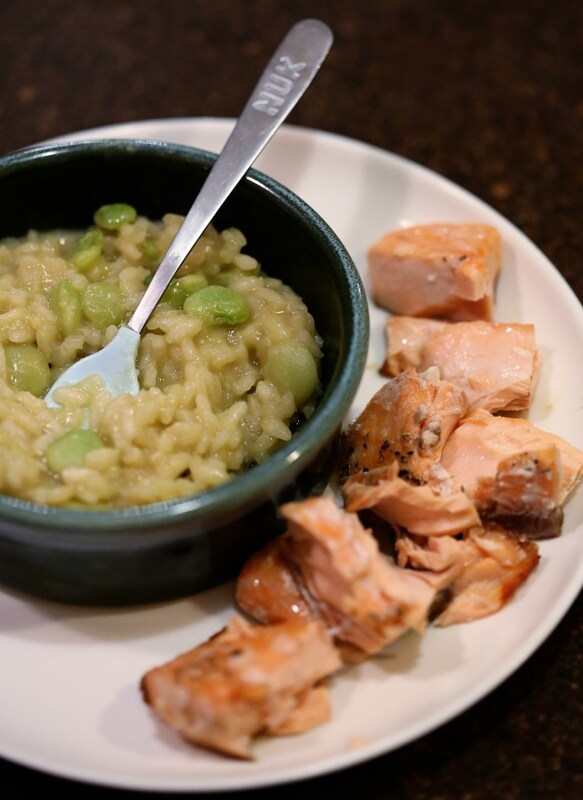 Serve the salmon fillets on top of the risotto, or flake the salmon into bite size pieces and serve risotto on the side, like I did for Ollie’s plate in the pic above! Enjoy! 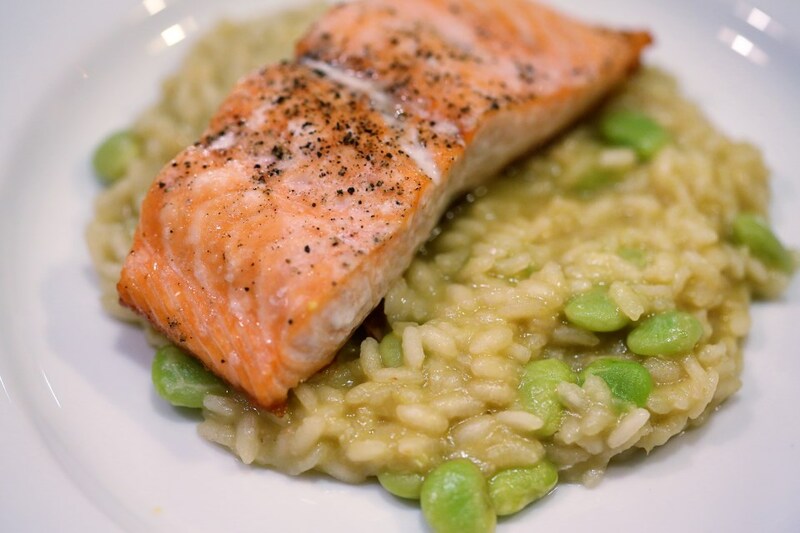 This entry was posted in Children, Fish, Healthy Meals, Uncategorized, Vegetables and tagged easy weeknight meals, green pea risotto, healthy meals, kid food, kid-friendly, risotto, roasted salmon, Start Fresh, Tyler Florence. Bookmark the permalink.